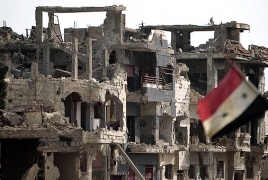 PanARMENIAN.Net - The Syrian Arab Army continued their operations inside the southern region of Syria on Thursday, September 6 targeting several areas controlled by the Islamic State in the Al -Sweida province, Al-Masdar News reports. According to a military source in southern Syria, the Syrian army managed to liberate more than 2 kilometers of territory occupied by the terrorist forces after a series of intense clashes. The Syrian army is now raining missiles on the large volcanic region in southern Syria in order to clear the trenches raised by the Islamic State forces in the Al-Safa area.